One of the largest challenges for anyone planning a wedding is determining if you should plan an indoor or an outdoor wedding. Some have always dreamed of an outdoor wedding, while others have always dreamed of finding the perfect indoor venue. Utah is home to so many beautiful venues and outdoor settings, and LUX has had our fair share of experiences with many of them! Here are some tips we’ve created to help you determine what type of venue is right for you! There’s a reason Alanis Morissette wrote a hit song about “rain on your wedding day,” simply put, no one wants rain to ruin their outdoor wedding. Using an indoor venue is the best way to ensure it doesn’t matter what the weather does, you and your guests will stay dry! Utah is notorious for rapid heat spikes in the dead of summer, which easily leads to guests overheating! With an indoor venue, you have the luxury of air conditioning to ensure everyone isn’t sweating to death. Like the weather, Utah’s mosquitoes, bees, and bugs can strike without warning! You may want to consider an indoor wedding if you are worried about pests bothering your guests. When you plan an indoor wedding, you have more control over your surroundings and the decor you are able to use in the space. You are able to take a blank canvas and turn it into your dream space. We find that walls and ceilings can be helpful with the decorative process and can bring a unique touch to indoor weddings. If you plan to have a large wedding, you need to look at the size and capacity of the venue. You want to make sure the venue capacity can hold the amount of guests you have comfortably, and for each event of the day. 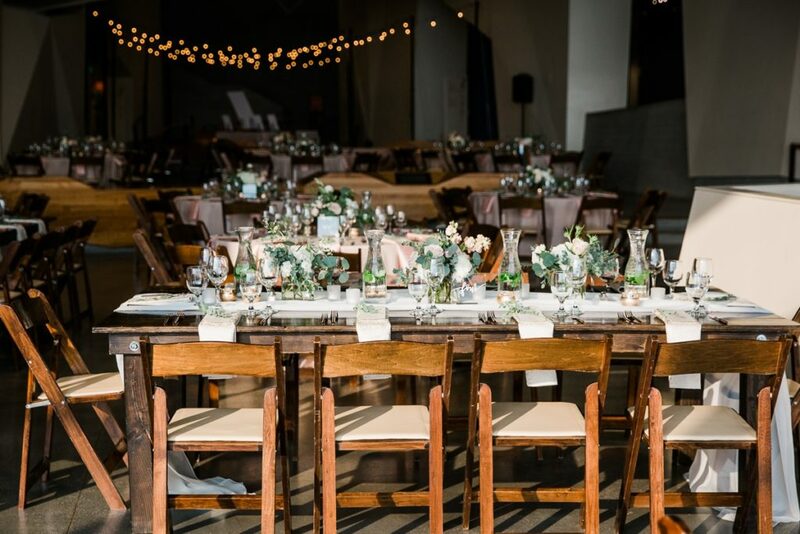 Each venue varies in size so you need to consider everything from the number of place settings you need to the size of the chairs and tables, and how they are set in the room. LUX works with you to help you get a guest list in place so you have an accurate estimate of the number of people that will attend your wedding. What better way to celebrate your nuptials than to enjoy sharing your vows with the beautiful backdrop of nature? No matter what you desire, the outdoor landscape has so much natural beauty and elegance to work with! Nature lends itself to the most colorful, serene, and ideal backdrops. While we have the skills to make anything look amazing, the initial start of Mother Nature herself is incredible. Being able to share your wedding with all the people you love and care about is one of the most important elements. When you have an outdoor wedding, you may have the ability to fit more guests, as most outdoor venues are spacious and hold a lot of people. When you hire a photographer for your wedding, they will ask about the venue. An outdoor setting gives them an arsenal of locations and backdrops, whereas interior photography can be limited in their ability to freely move and get in the right angles and positions to make the perfect photo. Not only is the space helpful for pictures, the natural lighting gives excellent vibrancy to the pictures without the need for intensive editing. One of the most unpredictable things about Mother Nature is never being 100 percent sure if it’s going to be great weather. Windstorms and rainstorms can be a hiccup in the summers in Utah, you may want to have a back-up plan in place if you are not comfortable with weather. Outdoor weddings are at the mercy of the insects that don’t always do what people want for a wedding. Most of the time outdoor weddings are blissful, but there are occasional times when you do have loud aircraft noise, and possible bugs that cannot be controlled. While nature is beautiful on its own, it could pose a challenge to get the ideal decorations you are hoping for. If you are hoping for a lot of hanging décor, you may want to conceptualize how to hang and display things in nature. Parking – It helps to consider the parking situation at any venue. If you plan on having a large venue, you’ll want adequate parking for everyone. Mood – An indoor wedding normally feels like a formal wedding whereas outdoors tend to feel less formal. Photography – Most indoor venues will allow you to take pictures on the grounds of the venue, whereas outdoor is your blank canvas. Consider this when you are considering photography and venue choices. Most importantly, remember that it is your big day! You get to marry the love of your life, don’t let the details cloud your happiness. LUX is here to be your guiding light through the planning process. Call today to schedule a consultation, and let’s create your special day together.